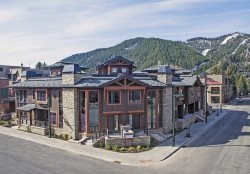 Conveniently located in downtown Ketchum, this 4 Bedroom, 4 1/2 Bath elegant residence is perfect for your Summer and Winter vacations. Anglers will enjoy the Big Wood River only steps away from the residence while skiers will appreciate they are only moments away from The River Run Lifts. LIVING AREA: Beautifully designed, the living area with mountain views is furnished with elegant Leather Décor, a warming Oversized Fireplace, and TV. GOURMET KITCHEN: The gourmet galley kitchen is well appointed with top of the line Appliances, Granite Countertops, and Countertop Seating for 4. DINING AREA: Adjacent to the kitchen is the dining area area which is open to the Living area, and becomes a great space for social entertaining. FURNISHED DECK: Outside, relax and enjoy the beautiful Sun Valley weather on the large furnished deck with Gas Grill. MEDIA ROOM: The media room is located downstairs with a Big Screen TV, Microwave, Coffee Pot, and Refrigerator providing instant access to snacks and beverages. Additionally, there is Free WiFi and a Private Office for those on working vacations. This residence is handicap accessible, complete with ramps, wheelchair shower, a electric chair up the stairs and special accommodations throughout. BR 1- Master Suite: Located upstairs with a Queen Bed, Ensuite Bath and a bonus room with a Twin Bed. BR 2- Second Master: Located on main floor with Queen Bed and Ensuite Bath. BR 3- Wheelchair Accessible Guest Bedroom: Located on main floor with Queen Bed with Ensuite Wheelchair Accessible Bathroom and Office. BR 4: Downstairs, there is a bedroom with Full Bed. The full bath is located down the hall. Private, Convenient, and Elegant- Edelweiss is the perfect Luxury Vacation Residence.